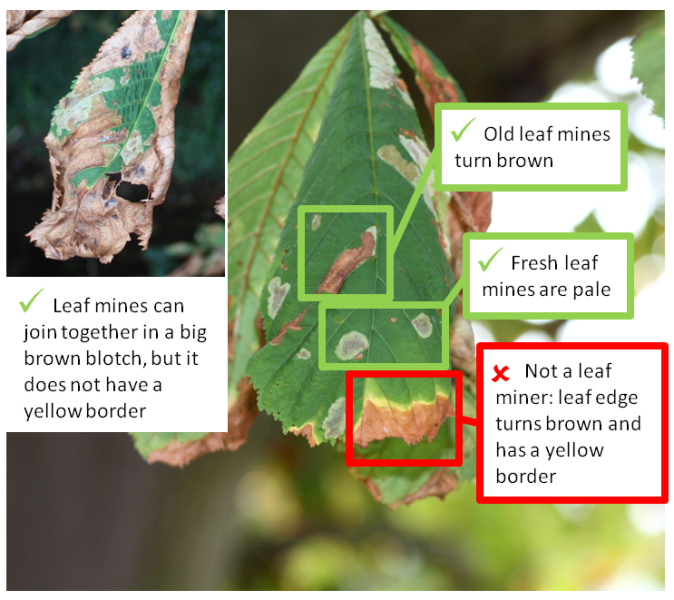 Sometimes the damage caused by the leaf-mining moth and the leaf blotch fungus can be difficult to tell apart. Colour Mines start whitish with a brown spot (once the pupa has formed) and then turn completely brown. There is always a yellow ring around the brown blotch. Shape Mines form a blotch with rounded edges that usually does not cross major leaf veins. 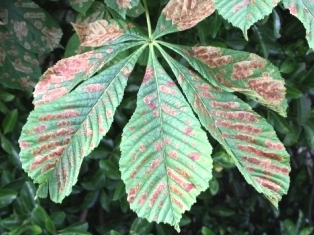 An irregular brown blotch that crosses major leaf veins, and sometimes even the midrib of the leaf. Holding it up to the light Often, a caterpillar or a brownish pupa can be seen in each mine when the leaf is held up to the light. 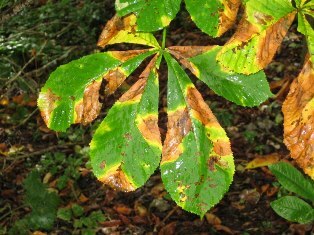 A peppering of frass (caterpillar droppings) remains in leaf mines. Even the smallest brown blotches cannot be seen through. The leaf after the damage Even once a leaf is completely brown, the pupal coccoons can still be seen once the top surface of the leaf is broken open. It may be possible to feel the bump of the pupal coccoon on the underside of the leaf. It is not possible to break open the leaf damaged by the blotch.